2018 was a banner year for new drug approvals. The FDA approved 59 novel drugs last year, compared with 46 in 2017 and well above the yearly average of 33 new drug approvals within the past decade. That’s a lot of new drugs to keep up with. To that end, here’s a rundown of just a few of the most notable approvals in the past year. Trogarzo (ibalizumab-uiyk) is the first in a new class of antiretroviral medications—monoclonal antibodies—that can provide significant benefit to adult patients with multidrug-resistant HIV-1 infection who have run out of other HIV-1 treatment options. Used together with additional antiretroviral medications, Trogarzo is administered intravenously once every 14 days. In a clinical trial involving 40 heavily treated patients with multidrug-resistant HIV-1 and detectable viral load, 43% who received Trogarzo in conjunction with other antiretrovirals achieved treatment success (ie, undetectable viral load). Most adverse reactions were mild to moderate in severity, although nine patients had serious adverse reactions. Xofluza (baloxavir marboxil) is the first new antiviral flu treatment in nearly 20 years with a novel mechanism of action. Administered as a single oral dose, Xofluza is indicated in patients aged 12 years and older who have been symptomatic with acute uncomplicated flu for no more than 48 hours. “When treatment is started within 48 hours of becoming sick with flu symptoms, antiviral drugs can lessen symptoms and shorten the time patients feel sick,” said Debra Birnkrant, MD, director, Division of Antiviral Products in the FDA’s Center for Drug Evaluation and Research, Silver Spring, MD. However, Xofluza is no substitute for the flu shot, FDA administrators noted. In two randomized controlled clinical trials that included 1,832 patients, those treated with Xofluza within 48 hours of experiencing flu symptoms had a shorter time to alleviation of symptoms compared with patients who took placebo. In the second trial, adult patients who received Xofluza demonstrated no difference in the time to alleviation of symptoms compared with those who received another flu treatment, although teenagers who received Xofluza had shorter symptom relief by nearly half of that of the other flu treatment. The most common adverse reactions in treated patients included diarrhea and bronchitis. Epidiolex (cannabidiol) is the first FDA-approved drug that contains a purified drug substance—cannabidiol, or CBD—derived from marijuana. CBD is a chemical component of the marijuana plant (Cannabis sativa), but it doesn’t cause the “high” that comes from tetrahydrocannabinol, the primary psychoactive component of marijuana. As such, the drug was initially classified as a Schedule I substance, but the US Drug Enforcement Administration later transferred it to Schedule V, the least restrictive category. Epidiolex is approved for the treatment of seizures associated with Lennox-Gastaut syndrome and Dravet syndrome, two rare and severe forms of epilepsy, in patients 2 years of age and older. In three randomized, double-blind, clinical trials involving 516 patients with Lennox-Gastaut syndrome or Dravet syndrome, researchers showed that Epidiolex was more effective in reducing the frequency of seizures than placebo. The most common side effects among treated patients in the clinical trials were sleepiness, lethargy, elevated liver enzymes, decreased appetite, diarrhea, rash, fatigue, poor quality sleep, and infections. Aimovig (erenumab-aooe) is the first FDA-approved treatment for the prevention of migraine in adults. It belongs to a new class of drugs that target and block the activity of calcitonin gene-related peptide—a molecule involved in the pathophysiology of migraine attacks—to reduce the number of days with migraine. The treatment comes in an autoinjector that the patient self-administers once monthly. In three clinical trials involving a total of 2,199 patients with migraine, those treated with Aimovig had between 1 to 2.5 fewer migraine days per month compared with those on placebo. The most common side effects were injection-site reactions and constipation. In addition to Aimovig, two other calcitonin gene-related peptide receptor antagonists were approved in 2018 for the prevention of migraine: Ajovy (fremanezumab–vfrm) and Emgality (galcanezumab-gnlm). Gilenya (fingolimod) was approved in 2010 to treat adults with relapsing multiple sclerosis (MS), but last year the FDA expanded its indication to treat relapsing MS in children and adolescents aged 10 years and older. This is the first FDA-approved drug to treat MS in pediatric patients. “Multiple sclerosis can have a profound impact on a child’s life. This approval represents an important and needed advance in the care of pediatric patients with multiple sclerosis,” said Billy Dunn, MD, director, Division of Neurology Products in the FDA’s Center for Drug Evaluation and Research. In a clinical trial that included 214 patients with MS aged 10-17 years, 86% of those taking Gilenya remained relapse-free after 24 months of treatment compared with 46% of those given another MS drug, interferon beta-1a. Side effects in pediatric patients were similar to those seen in adults, including headache, liver enzyme elevation, diarrhea, cough, flu, sinusitis, back pain, abdominal pain, and pain in extremities. Elzonris (tagraxofusp-erzs) is an infusion indicated for the treatment of blastic plasmacytoid dendritic cell neoplasm (BPDCN) in adults and children 2 years of age and older. It’s the first FDA-approved therapy for BPDCN, an aggressive and rare disease of the bone marrow and blood that can affect multiple organs, including the lymph nodes and the skin. BPDCN often presents as leukemia or evolves into acute leukemia. Before the approval of Elzonris, standard treatment was intensive chemotherapy followed by bone marrow transplantation, but many patients with BPDCN are unable to tolerate such demanding therapy. In a single-arm clinical trial that enrolled 13 patients with untreated BPDCN, seven patients (54%) achieved complete remission or complete remission with a skin abnormality not indicative of active disease. Regarding side effects, Elzonris has a Boxed Warning regarding an increased risk of capillary leak syndrome that may be life-threatening to patients taking the treatment. It’s not a cure for cancer, but Aemcolo (rifamycin)—an antibacterial indicated for adults with travelers’ diarrhea—could help millions of people afflicted with this problematic condition. It’s the first antibiotic approved for the treatment of this illness in more than 10 years. Travelers’ diarrhea is caused by noninvasive strains of Escherichia coli typically found in food and water. It’s the most common travel-related illness, affecting an estimated 10% to 40% of travelers worldwide each year. Destinations with the highest risk include parts of Asia, as well as the Middle East, Africa, Mexico, and Central and South America. In a randomized, clinical trial that consisted of 264 adults with travelers’ diarrhea in Guatemala and Mexico, researchers demonstrated that Aemcolo significantly reduced symptoms compared with placebo. The treatment is not for patients with diarrhea complicated by fever or bloody stool or due to pathogens other than noninvasive strains of E. coli. 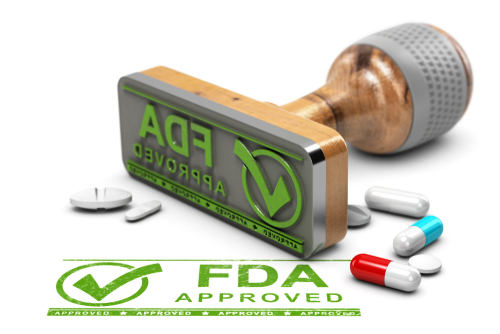 Lucemyra (lofexidine hydrochloride) is the first FDA-approved non-opioid drug to help reduce opioid withdrawal symptoms in order to facilitate the abrupt discontinuation of opioids in adults. It isn’t a treatment for opioid use disorder (OUD), but it can be used as part of a broader, long-term treatment plan for managing OUD. While Lucemyra may lessen the severity of withdrawal symptoms, it may not completely prevent them. It’s approved for up to 14 days of treatment. Lucemyra is an oral, selective alpha 2-adrenergic receptor agonist that reduces the release of norepinephrine, the neurotransmitter believed to play a role in many opioid withdrawal symptoms. Common side effects of Lucemyra include hypotension, bradycardia, sleepiness, sedation, and dizziness. Looking ahead in 2019, the FDA appears willing to smooth the way for more generic drugs than in the past. In addition, keep an eye out for more novel therapies to be approved, including the first oral antidiabetic drug for adults with type 1 diabetes, as well as drugs for Duchenne muscular dystrophy, rheumatoid arthritis, multiple myeloma, and cancer with multiple tumor types.